Chains and Snaps can be purchased separately at the bottom of this page. The XSmall, Small and Medium you will need 2 separate Smaller or Larger/Longer type Chain and Snaps. The Med-Long, Large, XLarge and 2XL you will need 3 larger/longer Chain and Snaps sizes. The ProGroom Pet Support Sling gives you a ready made helper for dogs that won't let you trim their nails or trim their paws. Made of heavy duty lightweight soft black canvas. Our slings support the dogs body and for elderly dogs they also add comfort. 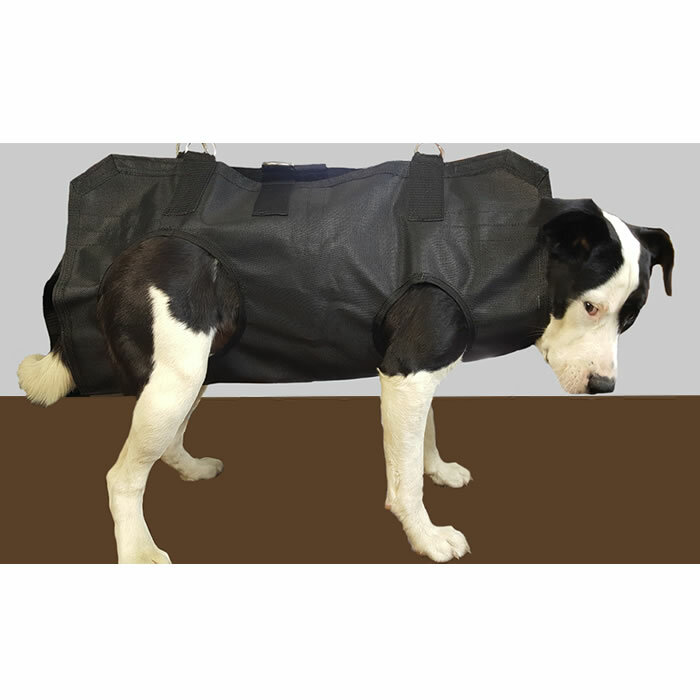 A support system that allows grooming of the paws, legs, face and tail with ease! The stainless hoops (D-Rings) are fully welded. ProGroom's Comfort Support Slings are double sewn and made to hold any size dog and weight. Need chains and snaps to hook the support sling to a grooming arm? 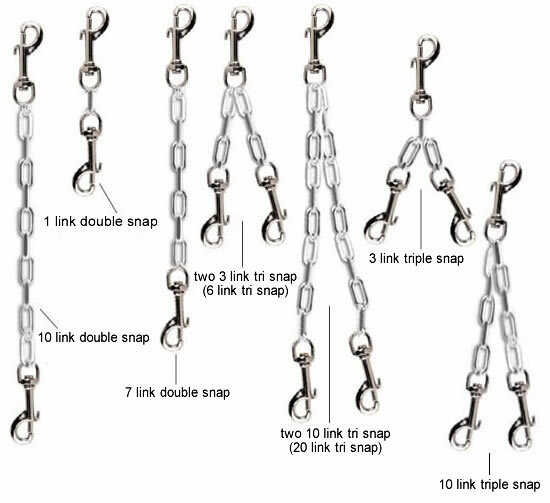 More information on the chains and snaps shown below. Each link is 1" long. The snaps are 2"-3" long. Use with a grooming arm or some customers do not use a grooming arm on their table, they hang the slings from a hook and chain from the ceiling joist, but over a table for safety reasons. As always if you purchase a chain and snap from other stores, please be sure your hook and chain are heavy duty, strong and secure for the sling and pet. How to measure your dog in able to choose the correct size. All dogs are different sizes. 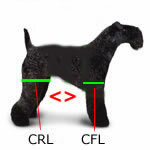 Measure your dog by holding a measuring tape from Center of Front Leg to Center of Rear Leg while your dog is standing. Example, if the measurement distance is 8 inches, then you will need to order a small, if the measurement distance is 13 inches, you will need to order a large (view the chart below (Center of Front Leg (CFL) to Center of Rear Leg (CRL) measurements. Take for instance, a cocker. Not all dogs are the same exact size. So, be sure to perform the measurements as stated above. XS 4" to 5-1/2" 13-1/2" 14"
SM 6.5" to 8" 15" 16-3/4"
MED 9" to 11" 18" 22"
MED/LONG 19" to 22" 26" 32"
LG 14" to 16" 22.5" 24"
XL 17" to 18" 28" 31"
2XL 19-20 inches 32" 34"
What Chain and Snaps do I need for my support sling size to hook to a grooming arm or chain hooked from a ceiling joist? Chain and snaps for this item sold separately. Link for purchase shown below.